EL SEGUNDO — Well after practice ended on Thursday, Lakers second-year guard D’Angelo Russell sat for a talk with Lakers associate coach Brian Shaw. Russell later stood up to listen to Lakers president of basketball operations Magic Johnson and general manager Rob Pelinka. Throughout those long discussions, one common message emerged on what they want to see from Russell for final 14 games of the 2016-17 season, including when the Lakers (20-48) host the Milwaukee Bucks (33-34) on Friday at Staples Center. Russell’s role has usually entailed being the Lakers’ starting point guard, a position where he has shown mixed progress. He has averaged 15.2 points on 40.2 percent shooting, 4.8 assists and 2.7 turnovers in 27.5 minutes. But in the first eight games after All-Star break, Russell posted 20.5 points on a 44.8 percent clip and 5.4 assists in eight games. Russell’s role has since changed, though. He has come off the bench in the past two games out of Walton’s preference to evaluated third-year guard Jordan Clarkson at point guard with a traditional lineup. Walton said he also remains undecided if that will continue for Friday’s game against Milwaukee. Other candidates include veteran guard Nick Young and guard David Nwaba, who’s in the middle of his second 10-day contract. Walton has thus far resisted the last option. So far, the results haven’t been good. Russell has averaged 7.5 points on a 25 percent clip, 2.5 assists and 4.5 turnovers in his two games as a reserve thus far. Russell has not publicly complained about his recent role. He only has advocated featuring him as an off-ball shooter with a ball-handling Clarkson, something Walton has done in segments. Despite Russell’s poor play and questionable body language, Walton said he has not caused any issues since losing his starting spot. Still, Russell conceded some struggles with his new role. Although he maintained he still was aggressive in Wednesday’s 39-point loss, Russell outlined the learning curve he has faced as a reserve. The bench role isn’t foreign to Russell. 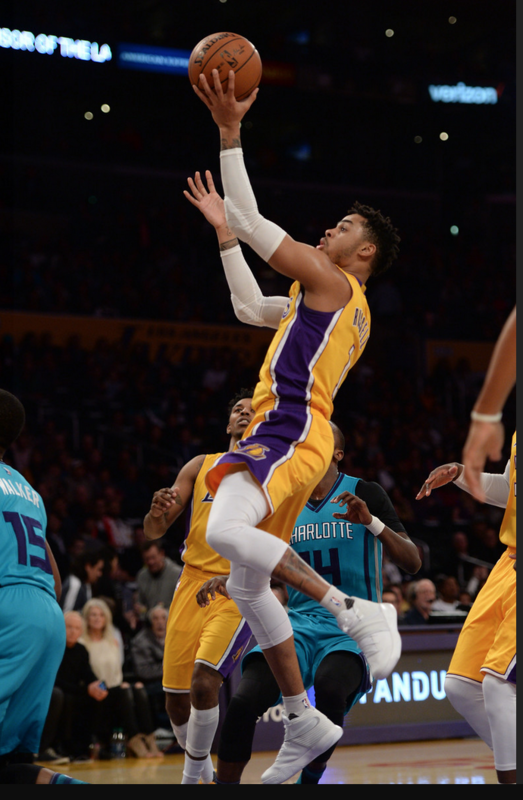 He lost his starting spot 20 games into his rookie season because former coach Byron Scott grew frustrated with the team’s record as well as Russell’s inconsistency, work habits and attitude. Walton said he has made the move out of the sake of collecting data in various lineups amid a season geared more toward development. Prior to this week though, Russell had not played with the reserves on the court or in practice. So even if Russell maintains he’s confident, the Lakers front office and coaching staff have provided him different feedback. To reduce Russell’s high level of turnovers, Walton wants him to find a better balance in minimizing risky passes without diluting his aggressiveness. To develop that rhythm, the Lakers’ brass, including Johnson, have told Russell to stay aggressive. Walton said he felt the same way, mindful that the Lakers’ front office shuffling from Mitch Kupchak and Jim Buss to Johnson and Pelinka could prompt questions on whether more moves are on the horizon. Follow L.A. Daily News Lakers beat writer Mark Medina on Twitter and on Facebook. E-mail him at mmmedina@scng.com. Subscribe to the “We Want Tacos” Lakers podcast on iTunes. Sorry, too typical excuses from Russell. I’m sorry, this guy not the answer. If inconsistency were the factor here, Julius Randle would be playing with the D League team.